Electrically insulated industrial glassfibre steps with glassfibre treads. Suitable for hazardous non-spark environments, cleanrooms etc. Electricity Boards Standard ESI 13-1 and ANSI 14-5 compliant. 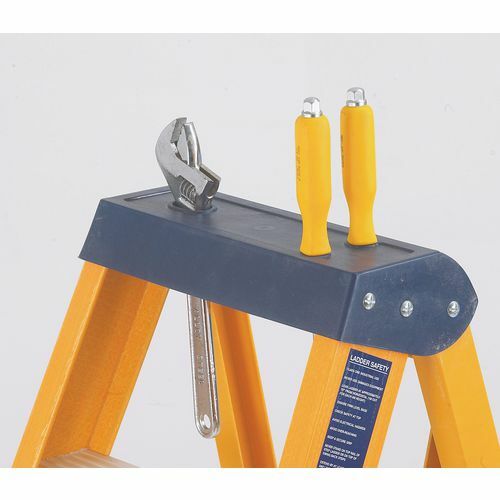 BS EN131 compliant, 150kg rated. Slip-resistant rubber feet and 85mm deep serrated treads for added safety. (N.B. Some components, e.g. rivets, are made of steel). 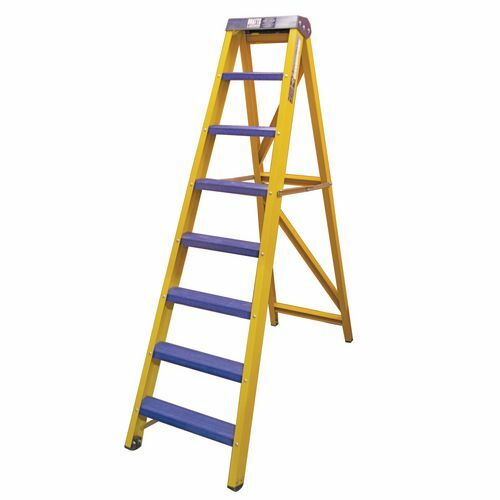 If you work in the food or petrochemical industries (for instance), you will need a reliable and appropriate ladder for your working environment in order to adhere to health and safety protocols. Our heavy duty kite marked glass fibre swing back steps are non-conductive with added hygienic and chemical resistant properties making them ideal for use in industries with specific requirements. 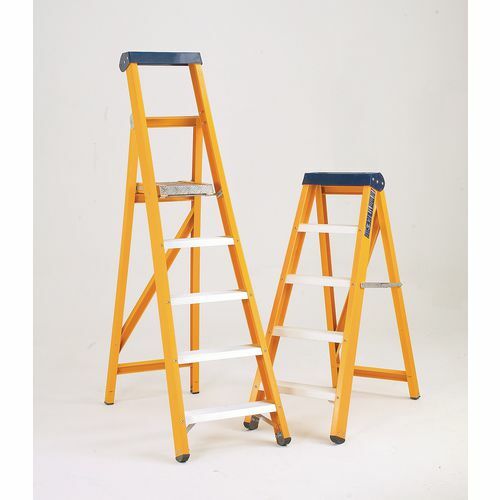 Slip-resistant rubber feet and 85mm deep serrated treads are built in for added safety - they also have a tool holder, set in the top of the ladder to make working at height easier for the user. These products comply with BS EN131, the Electricity Boards Standard ESI 13-1 and DNSI 14-5. Available in a choice of seven different numbers of treads; 4, 5, 6, 7, 8, 9 or 10 - they have 150kg rating for industrial use. Our heavy duty kite marked glass fibre swing back steps come with a 12 month guarantee and FREE UK Delivery.